Summer is in full swing and who doesn’t love to go swimming! 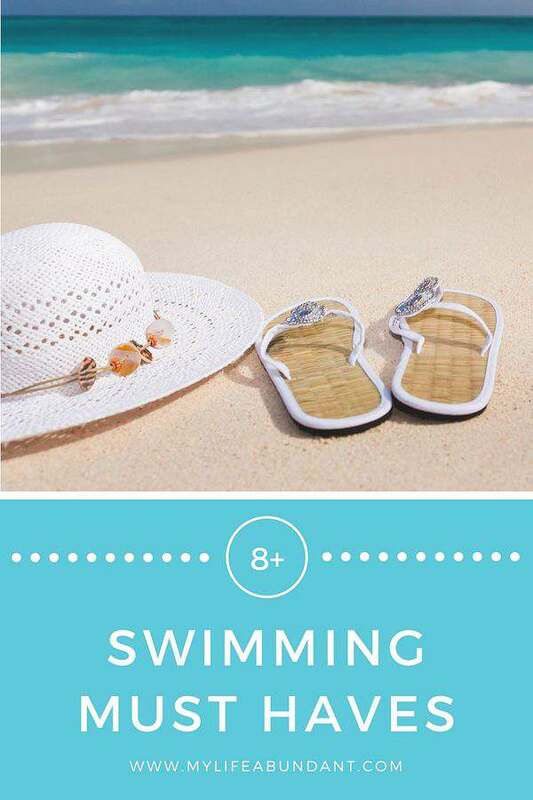 Since I live where we can swim virtually everyday, I wanted to share a few of my favorite must have items I use while enjoying a day at the beach or the pool. I’ve had my toes in the water or sand pretty much since I’ve been on this earth. I lived in California and Hawaii for several years while my dad was in the military and learned how to swim at a young age. Every summer, I would walk to the city pool and spend all afternoon there. While I was in Girl Scouts, I would go to summer camp and there wasn’t a day that went by I wasn’t in the lake. Now that I live in Florida, I have the ocean on each side of me and several pools in our community to use all year long. One of my favorite things to do now is taking Deep Water Aerobics at our community pool. Its a great way to get a great workout but stay cool at the same time. It also doesn’t put any stress on your joints. If you ever decide to take any deep water classes, you will need an Aqua Jogger buoyancy belt to wear around your waist. Check your local YMCA to see if they have any water classes to enjoy. My style hasn’t changed that much over the years and you will see that in my list of swimming essentials. These items have lasted for years and I rarely change them out unless they are damaged. Classic styles seem to never change and I’ve learned that sometimes it’s a good idea to spend extra money on a well-made item that will last for years. I am a frugal person, so not having to replace items often is saving me money. I have worn the Lands End Tugless swimsuit more years than I can count. I love this suit because it just fits perfectly on my un-perfect body. It doesn’t rise up in the back or isn’t high up on the hips. I’ve never been a two-piece bathing suit kind of person and this suit makes me feel like I’m not showing the world what they don’t need to see. 😉 There are several colors and patterns in the tugless one-piece swimsuit. I also wear Lands End Cotton Cover-Ups for basically the same reason I wear their tugless tanks. They come to the knee and wash up well year after year. They come in several solid colors or prints. Its a perfect cover-up for leaving the beach or pool and running an errand. It looks like a cute summer dress. Either at the beach or doing my walking in the pool, I love my Mary Jane Water Shoes. They are made to live in the water. The mesh will let the water and sand drain so it doesn’t irritate your feet – perfect choice going from the car or hotel room to the beach. Also, much easier to walk around in the sand than flip-flops. TIP: Lands End runs sales basically every single day. Sign up for their newsletter to receive their sale codes. Also, when you sign up you will receive an email with a 40% off coupon to start off with. Make sure you put your birthday in your profile. This year I received a $50 off $100 coupon. I was able to buy several sale items for just $50! They also offer 30% and 40% off coupons often. Another classic item I use is my Ray-Ban sunglasses. I never leave the house without them. I bought my first pair when I started wearing contacts back in high school. I now have a prescription pair since I don’t wear contacts anymore. But, I still have those original frames which have been converted to computer glasses. They are 40 years old and still serving a purpose. Protect your eyes from the sun! I have a couple of hats I wear when I’m at the beach or the pool. When I’m doing my water classes, I wear a Navy baseball style cap my dad gave me several years ago. I love that cap and the memories that came with it. When I’m just outside in the sun, I like to wear a wide brim beach style hat that will keep the sun off my face and neck. What I love about this hat is that it’s packable, doesn’t get crushed and will come out of the suitcase with no seams. When it comes to beach bags, mesh is the way to go. Preferably, one with many pockets. My mesh beach bag was a birthday gift several years ago and I love it. It’s light and doesn’t hold water or sand. When I was in college, I went to Florida for the first time and I was given a really nice beach towel. It was so thick and soft and I have carried that towel ever since to every beach and pool I’ve been to. Until…….last year when I was getting into the car and I had that towel wrapped around my waist and when I sat down, it split and tore. I almost cried. I kid you not. So, I waited for the next sale and bought another one. When I was a teenager, I was a sun worshiper. I loved laying out at the pool or in the backyard. Then when I turned 21, I saw skin on a woman who loved to play golf and be outside as much as possible. I immediately knew I didn’t want my skin to look like alligator skin. I started using sunscreen ever since and I’m glad I did. I’m not sure what brand I started out with but for several years now, I have been using Neutrogena sunscreen. I love the Ultra Sheer Dry-Touch version they have now. It’s not greasy at all. Which is good for my oily skin. I don’t wear that much makeup while I am out at the pool or beach. For my face, I usually just use sunscreen above. But, if I’m wanting a bit of color I use a tinted sports sunscreen with SPF 30 called Thinksports Everyday Face Sunscreen. My eye makeup consists of waterproof Almay One Coat Mascara which has been around since I started wearing contacts. For my lips, I use Neutrogena’s Revitalizing Lip Balm with tint for a hint of color and SPF 20. I love that little bit of color. Public Service Announcement: All those earlier years of not protecting my skin has shown up in my later years. My husband and I went to the dermatologist recently to have a full body check of all our little brown spots and moles to make sure there wasn’t anything not looking normal. We both had two biopsies done on a couple of spots just to make sure. If any of them come back showing signs of basal cells, they will remove a bit more skin in that area. Very common procedure done in the doctor’s office and is very treatable if found early. Look at your skin. Look for changes in moles or dark spots. Have someone check in areas you can’t see. The two spots which were removed from us the other day were on our backs. Wear sunscreen every day to protect your skin. I have kids, so my list is completely different. I am excited for summer, though, and have lots of pool days planned. A hat and sunscreen are important for everyone. My mom was diagnosed with skin cancer a few years back and she’s never even been one to be in the sun. You can’t be too careful. I always wear sunscreen when I go out to swim. There is skin cancer runs in the family and I don’t fool with it! I almost always use the other items when I am going to go swimming. 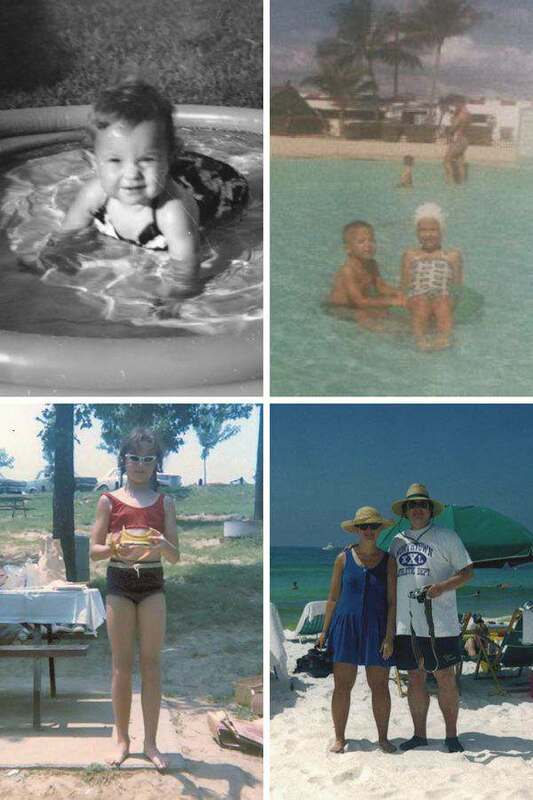 I never grew up with that much interest in swimming, even though I lived near Lake Michigan. We only got about 3 months of the year to enjoy the outside and I always like other activities. These are some great must haves, there is nothing like managing to get down to the pool in the summer and just relaxing and having fun. But you need to make sure you are safe when you do it. Thank you for adding that PSA, it’s such an important reminder. I hope that your biopsies come back normal! All of the things on your list are definitely must-haves, especially the sun screen! Ooh, and a great beach towel! I have always lived in Ohio, but I have always loved the water. I’m hoping to move to Florida someday to have more opportunities to be in the water! I love your list! Land’s End is great for suits. I need to consider the Mary Jane water shoes for vacationing and beach trips. If they drain water and sand effectively they could be super useful. Land’s End really has some great stuff. It’s easy to get a good deal on it and it lasts for ever! I love how durable their stuff is. I love the swimming pictures for your childhood…so sweet. A wide brim hat is a MUST at the beach. We swim absolutely every single day in our house! I agree with your whole list, amazing items on it! I haven’t really thought of using water shoes. Now that you mentioned it, I should consider getting one. These are great suggestions. We love to go swimming. I enjoy sitting on the beach, but I love pool time. Both make some fun memories. Sunglasses, sunscreen, hat, swimsuit are really my swimming must haves. This is before because now I consider my camera as one too! I have been looking for a good cover up! I will have to check this one out!! Sunscreen is our must have! We are fair skinned and burn so easily so we constantly reapply! I have super light skin. 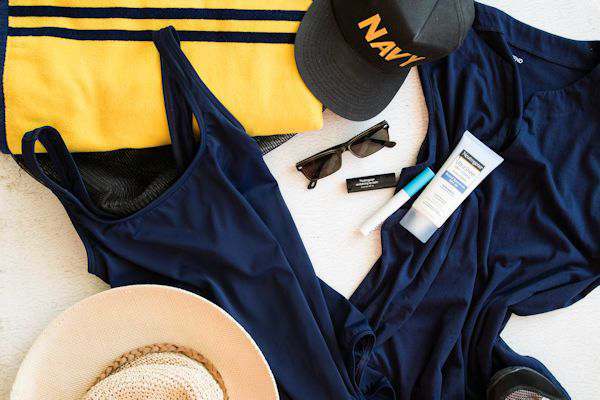 My swimming must haves are sun protection items like a long sleeve swim shirt, wide brimmed hat, and waterproof sunscreen. I never had a decent and fashionable coverup. We just use bath towels so we can dry up ourselves after dipping into the water. Water shoes sound cool. This is an awesome list. I love being in the water. I wish we could live where we could swim everyday! This is a great list. I’ve been looking for better cover-ups I will have to check out this brand. This is a great list. Lands End does make really great swimming suits. We have several more things we add to our list since we have a handful of kids going with us, but this is a great place to start. I just recently added a nice big floppy hat to my poolside bag. While I have always had sunglasses on, I find the hat helps shade my face so much more. Great items to bring. Pics posted looks fun. We love going on swimming too, all my cousins and siblings are good swimmer, but not me lol. I love this list…great post. I love the items you recommend when you go swimming. We recently went to the beach and pool on vacation and carried many of these of items. I definitely know what to add to my list in the future! Water shoes are definitely super important. I always forget them when I go to the beach or go swimming. This is a great list of swimming must have items. I have never worn a hat but would love to check this hat out and this Lands End Tugless one piece swimsuit. 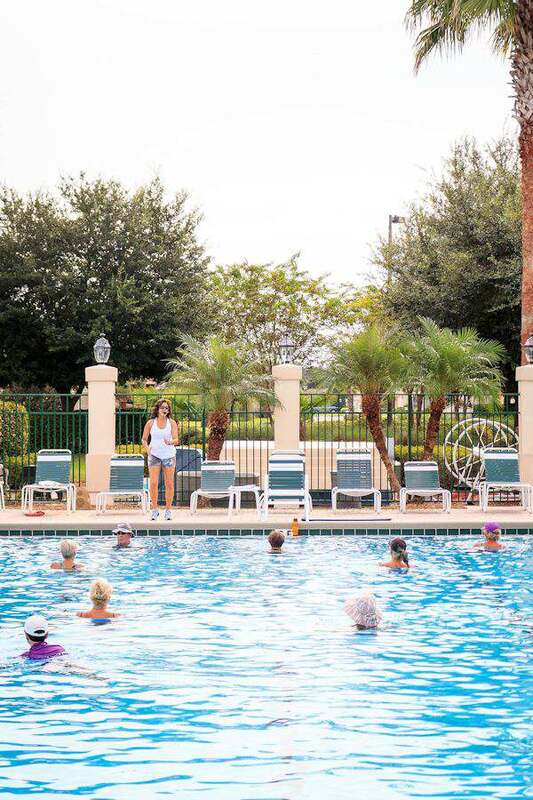 Thanks for sharing the list and I would love to try the Deep Water Aerobics because of my fibromyalgia. My most important swimming must-have is sunscreen with at least SPF 50. That would make an adventure worry free and truly fun.